I thought I'd take a break from zippered bags to share a bit of drafting today. 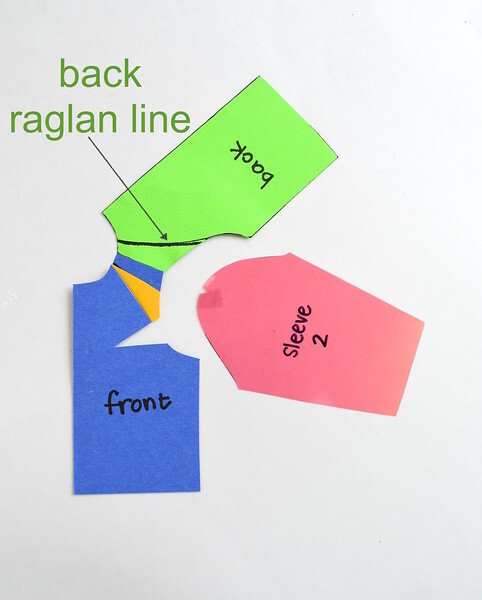 I was looking through my old drafting posts when I realized that, in spite of having made multiple raglan sleeve garments, I'd not actually done a tutorial on the raglan sleeve sloper. 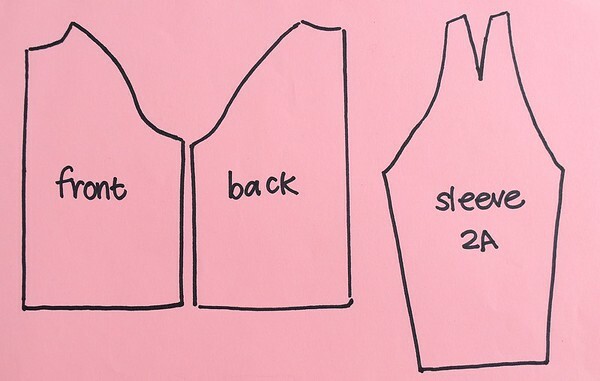 Or any raglan sleeves tutorials in general. 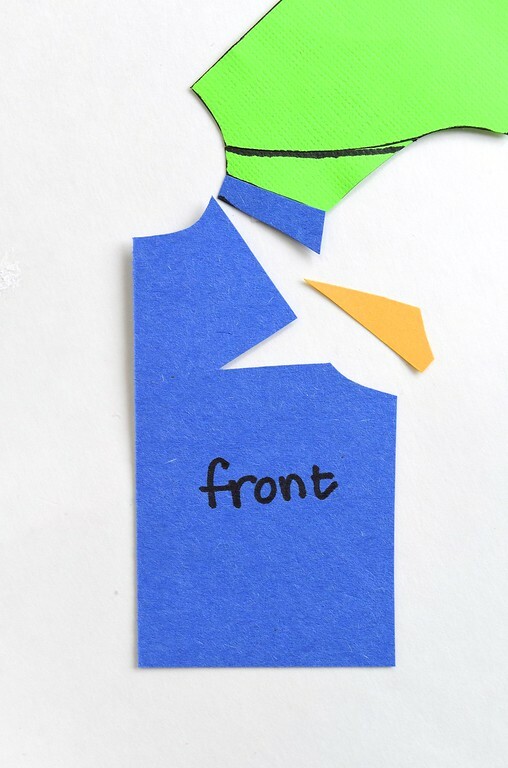 So I found some colored paper and cut some shapes out to play with, to make a tutorial for you. So, let's talk about raglan sleeves, shall we? 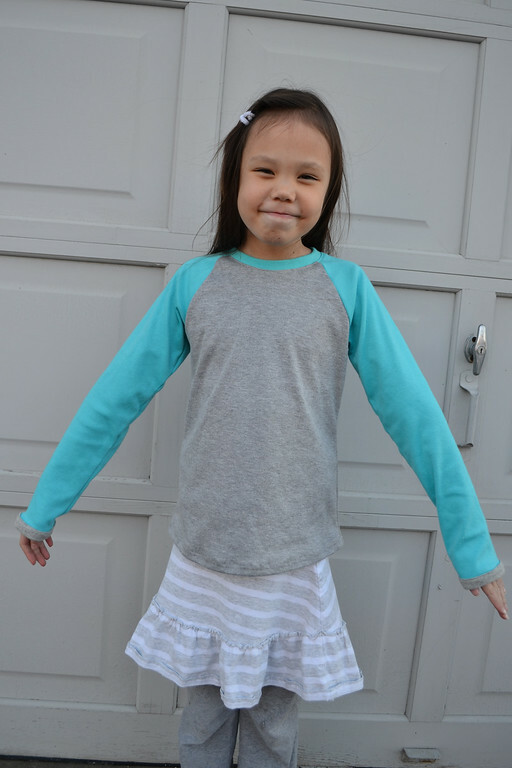 First, the raglan sleeve is a kind of sleeve. 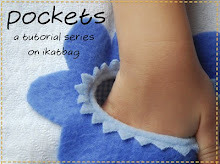 It is different from a set-in sleeve, which is so called because it is set into an armhole. The raglan sleeve does not fit into an armhole. 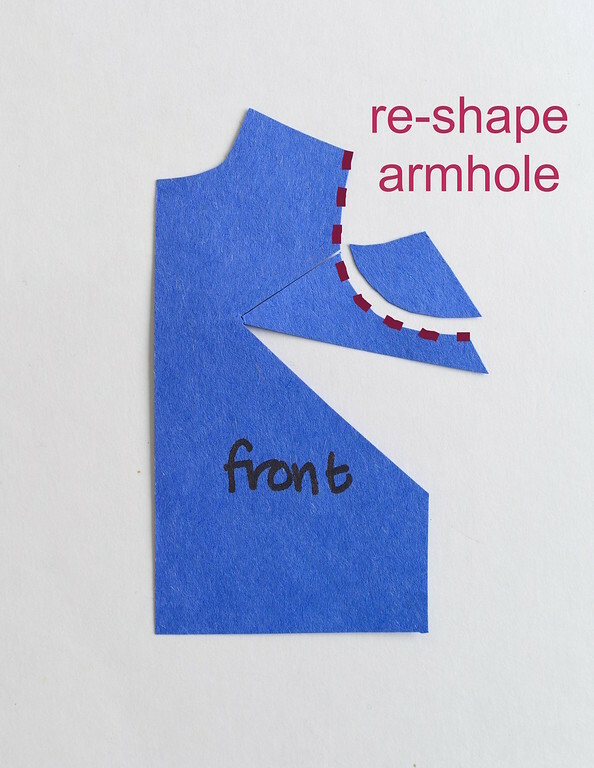 There is indeed a gaping hole around the shoulder region into which the raglan sleeve is fitted, but it isn't technically a true armhole that's seamed around your armpit and shoulder point. Second, while one can draft the raglan sleeve from scratch, a raglan sleeve can be derived from a set-in sleeve in the sense that we draft the latter sloper or body block with its armhole, and modify that into a raglan sleeve block. Done right, it should give as good a fit just as a regular set-in-sleeve sloper would, because it was based on it, and customized for that same wearer. Third, the raglan sleeve in practice, at least in my own experience with it, is not as straightforward to fit as a set-in-sleeve. Maybe more experienced tailors and seamstresses can draft it perfectly on the first try, but I usually have to do a couple of muslins before I am happy with how it fits. Sometimes, simply by changing the fabric, the fit changes to the point where I might even need a different muslin altogether. 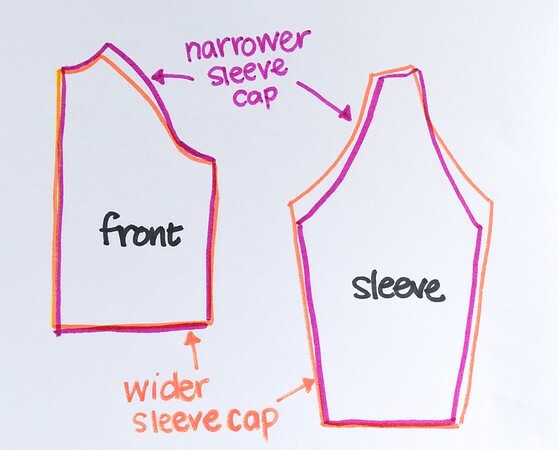 I think it has to do with how the raglan sleeve is not just an arm-sleeve; it extends over the shoulder point and partway into the shoulder area, up to the neck. 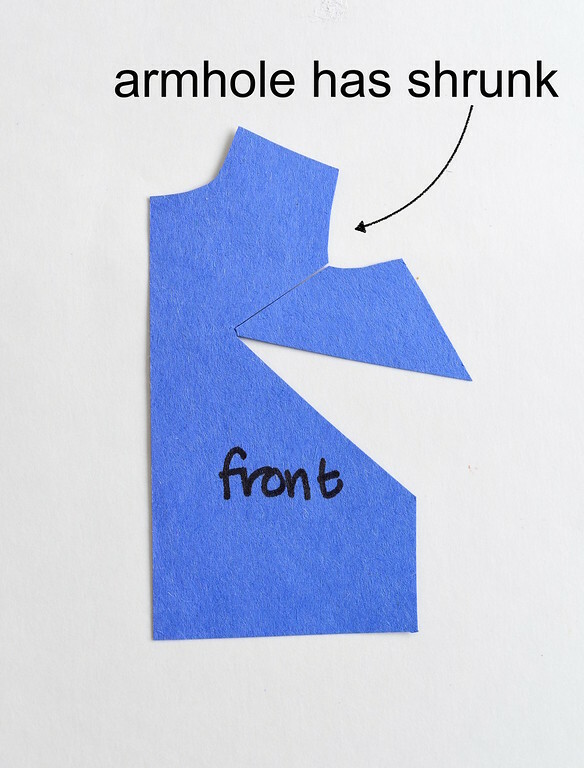 Therefore, we are essentially fitting the bicep, the armhole, the shoulder and the neck. 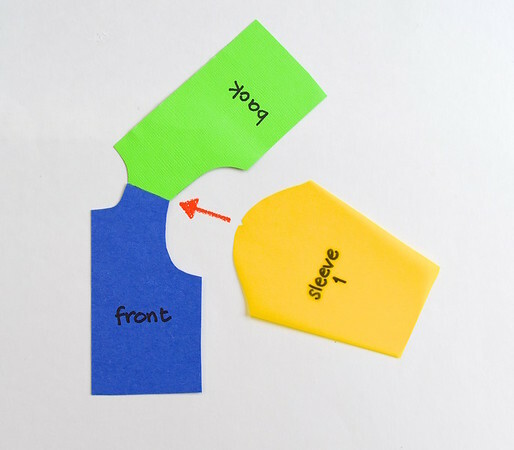 Also, with the raglan line already cutting across the bodice, adding further bodice darts (bust, waist, for instance) creates additional lines that require clever seamwork and design in order to avoid having the final garment look like a disaster. 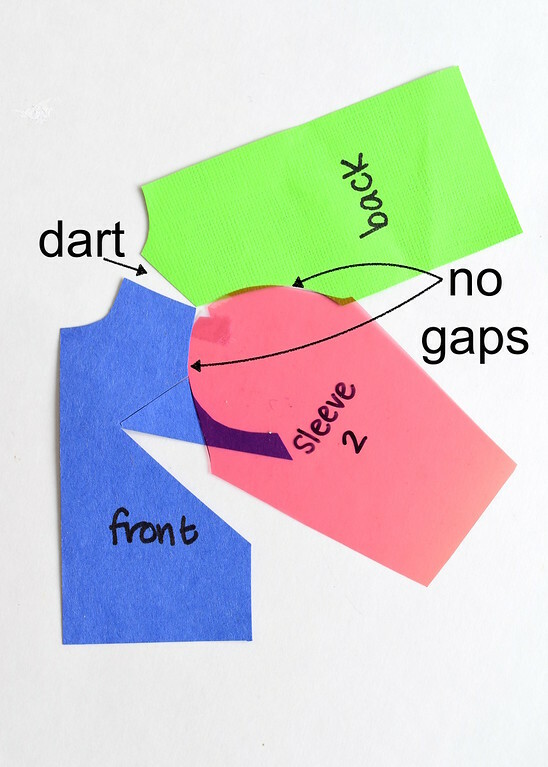 Practically speaking, this means using the raglan sleeve construction in looser-fitting garments (no need for darts), or in knit/stretch garments (again, no need for darts) or else incorporating the contouring within the natural seams or within the raglan line itself (which is a natural seam). 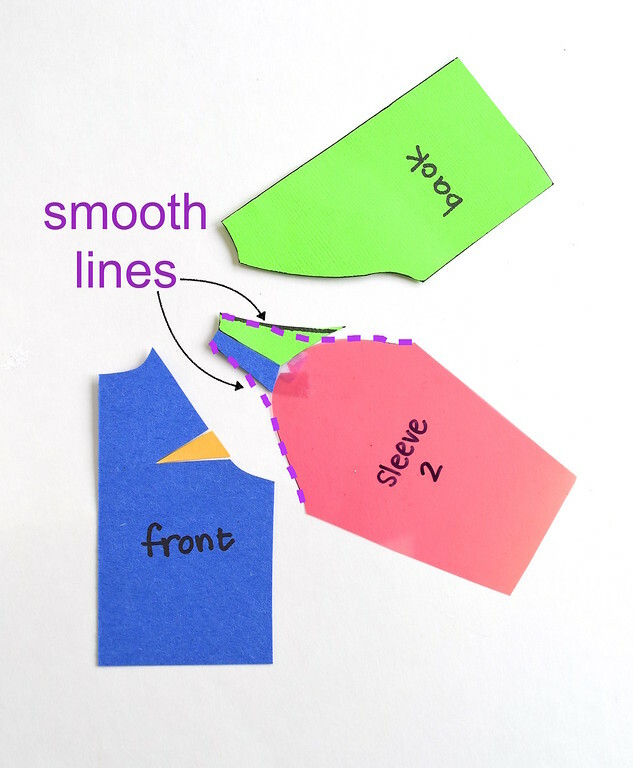 There are always exceptions to any rule, of course, and if we've learned anything about drafting and shaping, it's that if you understand the principles, and can visualize flat-pattern on three-dimensional contours, there are no rules, really, for getting a garment to fit you the way you want it to. 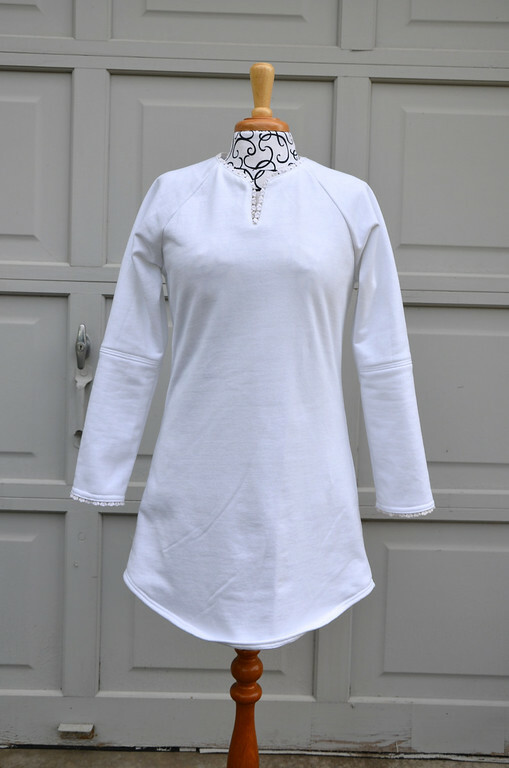 Much as I enjoy drafting and deconstructing drafting, I don't feel inclined to draft a Raglan Sleeve Sloper from scratch or even redraft my own French Dart Sloper into a Raglan Sleeve Sloper and make a garment out of it to show you all the different ways it can fit or not-fit. Two reasons: one, I feel lazy and hay-feverish, and two, as earlier mentioned, we'll be going through several muslins before I'll be satisfied, and even then, it'd be a draft-by-feel thing, whose unmethodicalness would drive the Type As among us bonkers. 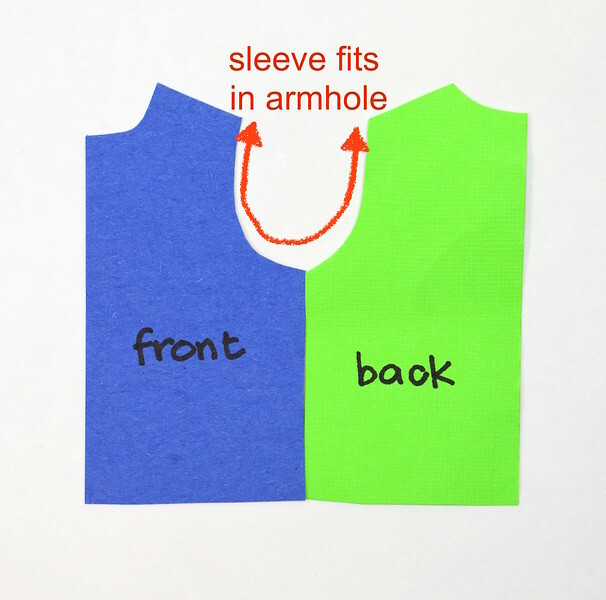 Instead, I thought I'd share conceptual diagrams with you - big-picture illustrations to explain how a set-in-sleeve becomes a raglan sleeve, and what to do with superfluous ease and bust darts and stuff like that in the final raglan draft. It will more General Idea-ish than Formula, but I will try to extract principles to point out, so we can pretend that there really is a method to the madness, okay? And on that cryptic note, let us begin! 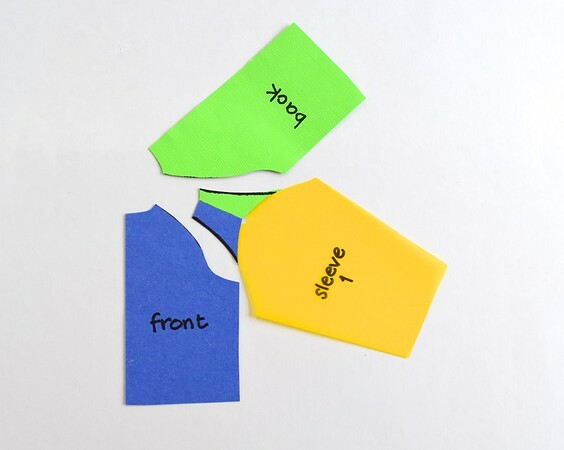 These here are little scraps of paper representing the Front Bodice (half), The Back Bodice (half), and the Classic Set-in Sleeve (whole). 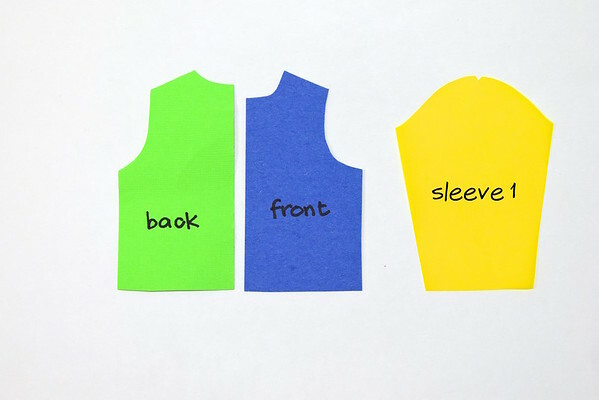 The length of the sleeve is not important; only the sleeve cap portion is. is correspondingly asymmetrical. Here are two sleeves superimposed. 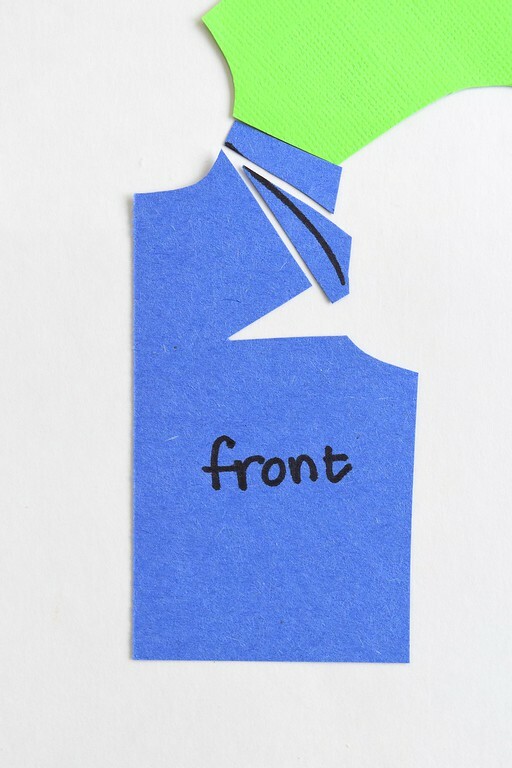 Notice the little notch at the top of the sleeve cap - a visual cue that divides the sleeve into front and back segments. 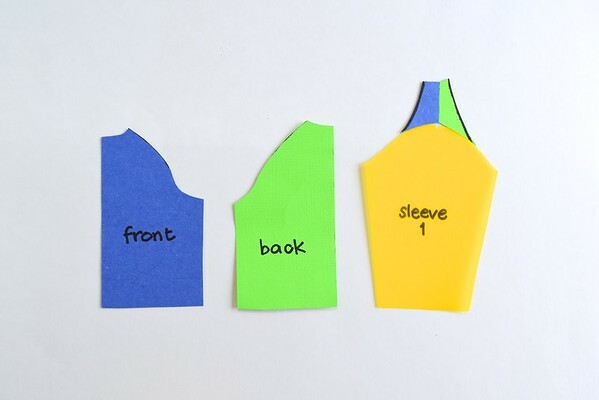 Let's imagine that we're going to do a flat attachment of the sleeve to the bodice i.e. we'll sew the shoulder seams together but not the side seams of either the bodice or the sleeve, and then attach the flat sleeve. Sleeve #1 is a bit of a fattie - it has a very broad and flat sleeve cap. 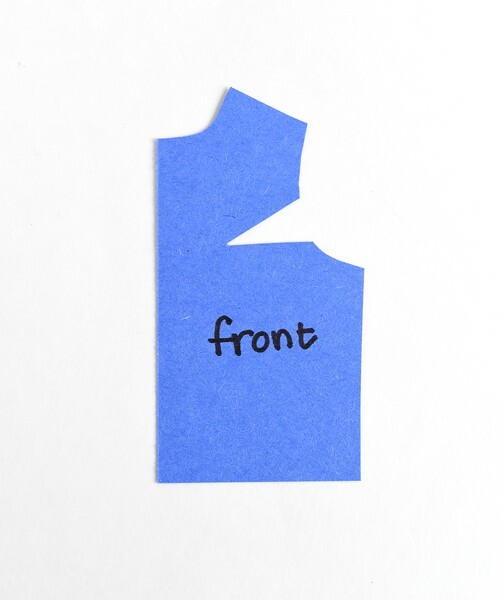 Roughly, this is how the sleeve will fit in that armhole - we match the sleeve's midline notch to the shoulder seam, and align the curves as best we can. 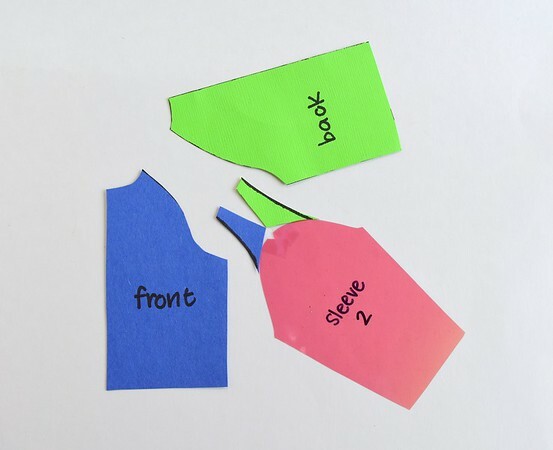 The armpit portions will overlap, as they should - in the actual fabric , that provides the ease needed to curve the sleeve and bodice around the body. 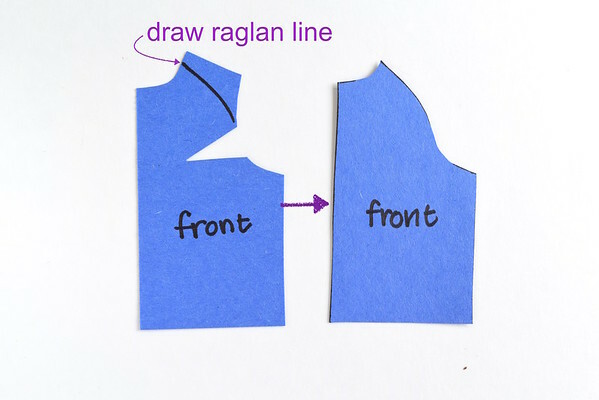 Next, we draw the raglan lines, following the curve of the sleeve cap where it intersects the bodice, toward the neckline. Q: Back up! Where exactly do we draw the raglan lines? 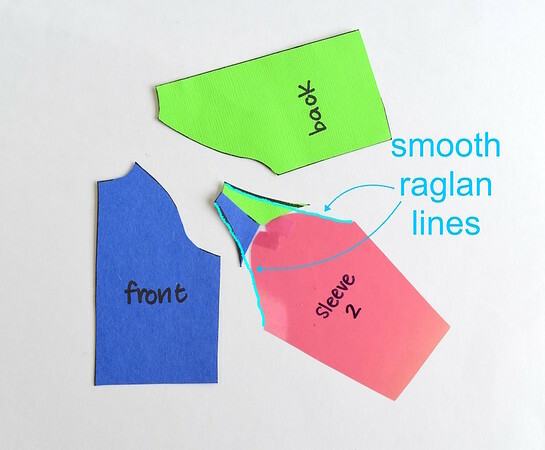 A: The exact orientation of the raglan lines depends on multiple factors - the design of the garment, primarily, but also the shape of the wearer's shoulders, the function of the garment (e.g. casual wear/more formal wear/limited arm movement/a lot of arm movement), and so on. Here is a diagram that shows different raglan line positions. 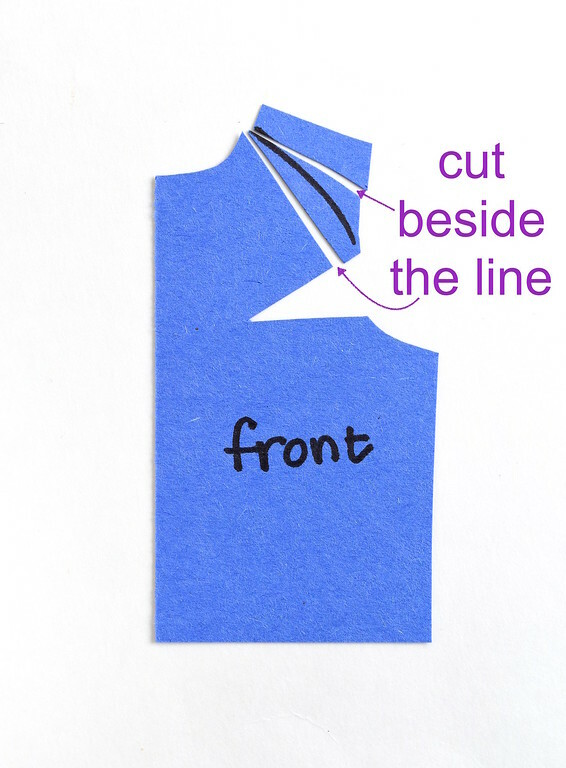 Summary: you can draw them wherever you like, as long as they open into the neckline and bypass the original shoulder seam. Now we cut along those raglan lines to separate the bodice from the sleeve. the front and back bodices, and the raglan sleeve. 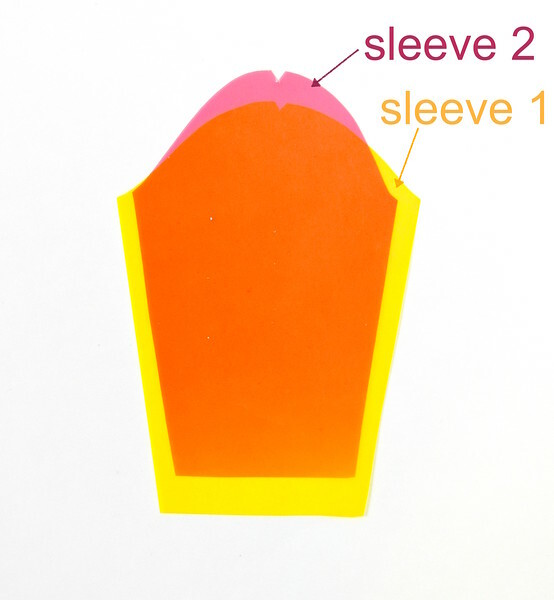 The yellow sleeve (Sleeve 1) in the earlier example had a very fat sleeve cap. Fitwise, this sort of sleeve cap is extremely comfortable because it has a lot of ease, particularly around the bicep and armpit area. Raglan-style T-shirts, for instance, tend to be derived from such raglan blocks. A more realistic raglan sloper has a more fitted sleeve (because remember: slopers are fitted) - like Sleeve 2, below. 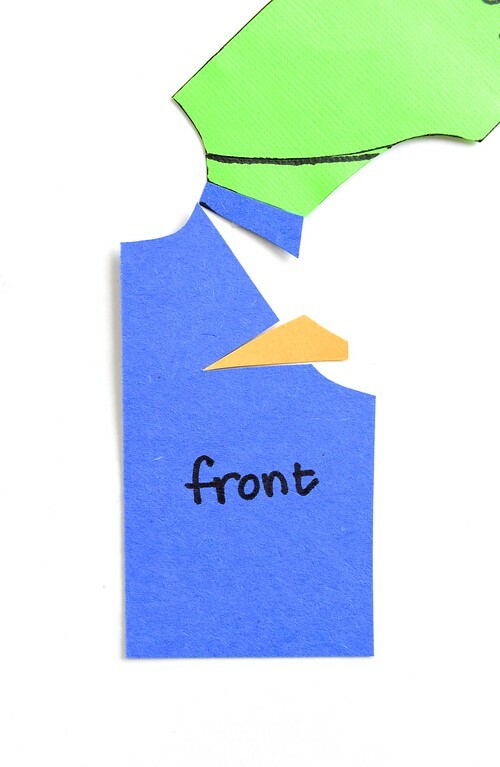 Sleeves like these are drafted for a more vertical hang (e.g. a coat or jacket), or for slender arms, or for a closer fit, and so on. Note that the sleeve cap length (i.e. 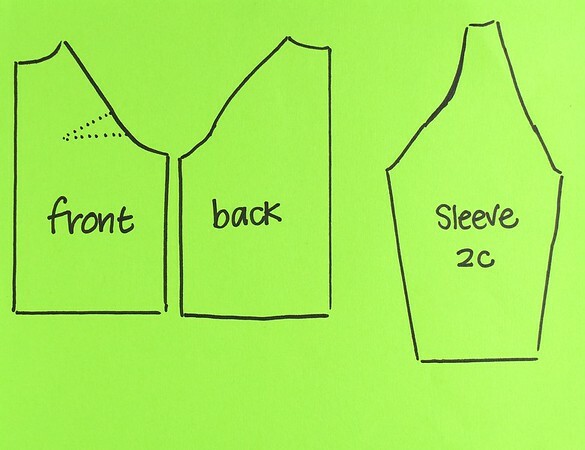 the length of that curvy line) is the same for both Sleeve 1 and Sleeve 2. But because Sleeve 2 is pointier, its width ends up being narrower. See this post for a more visual treatment of this relationship. Now let's fit this new, pointier sleeve into the same armhole as before. Behold the gaps - this new sleeve doesn't fit quite perfectly in the armscye as the first, fat one. This has to do with contouring; hold on to that idea - we'll return to it soon. 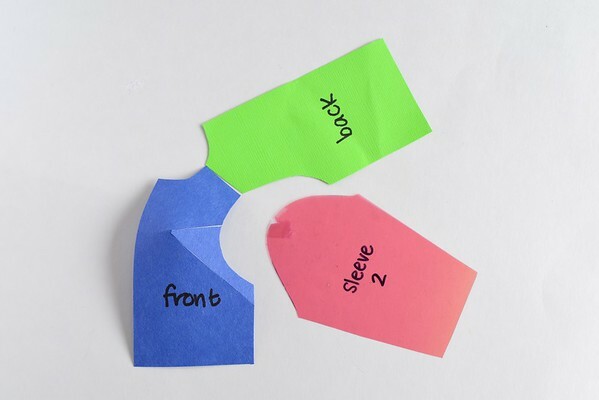 Let's look at two ways to adapt this pointy sleeve into a raglan. Open and spread the shoulder seams about the shoulder point to close those earlier gaps. Now everything fits like in the case of the fatter Sleeve 1. Except for that wedge-shaped gap between the shoulder seams. here is the new raglan sleeve block for The Pointier Sleeve. That wedge-shaped cutout becomes a dart in the top of the sleeve, to allow it to wrap over the top of the shoulder without gaping at the neckline. which we then close. 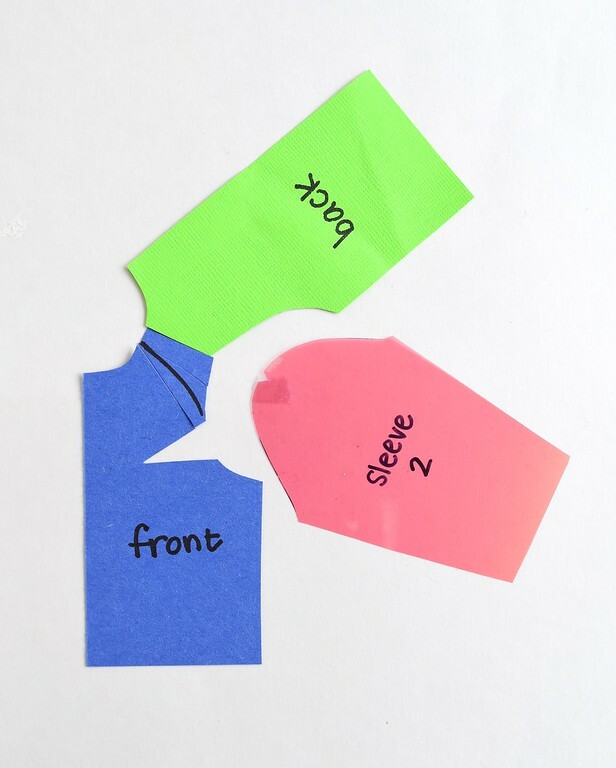 The little green and blue pieces on the sleeve cap will shift and, if you observe them within original cavity between the bodice pieces, create new gaps beside each raglan line. This is where the ease has "moved" to - and we will take that ease (thus "contouring") into the raglan seam itself, like a hidden dart. It works on the same principle as princess seams. Redraw smooth the raglan lines on the sleeve. Here is the alternative raglan sleeve block, which we shall call 2B. 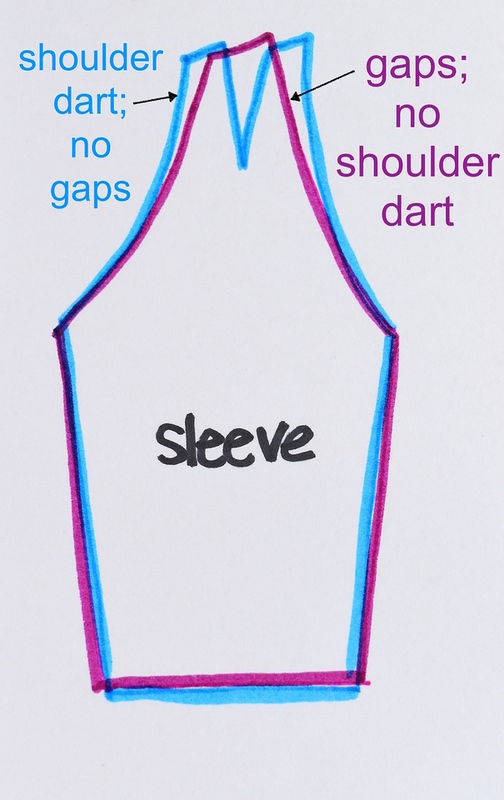 Here are those two sleeve blocks superimposed - the blue is 2A, with its shoulder dart, and the purple is 2B, without, but which is contoured along its raglan lines. In theory, both should achieve an equivalent fit. 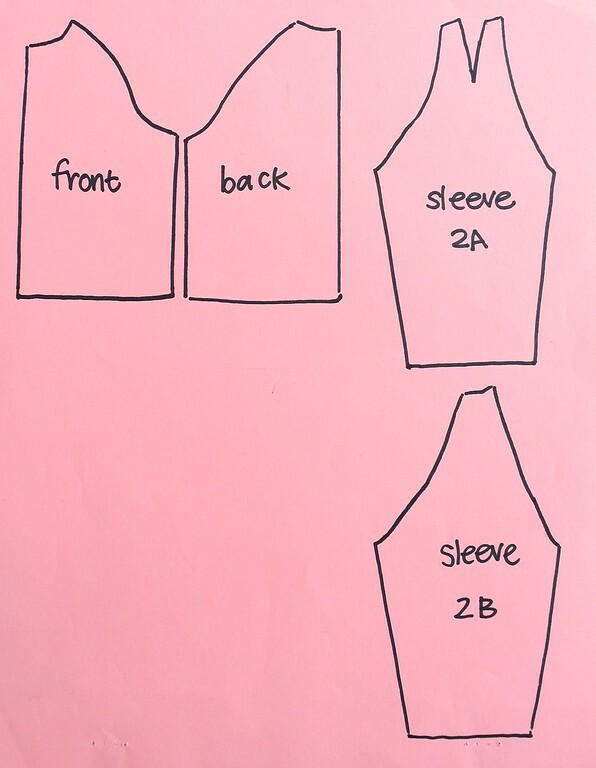 Here is a comparison of Sleeve 2B and Sleeve 1, showing the difference in drafts for a narrower and wider sleeve cap, respectively. Now let's be ambitious and introduce darts. Bust darts, specifically. The raglan sleeve design is prevalent in Tshirts and other casual garments because it is very forgiving, fitwise, for a multitude of different shoulders. 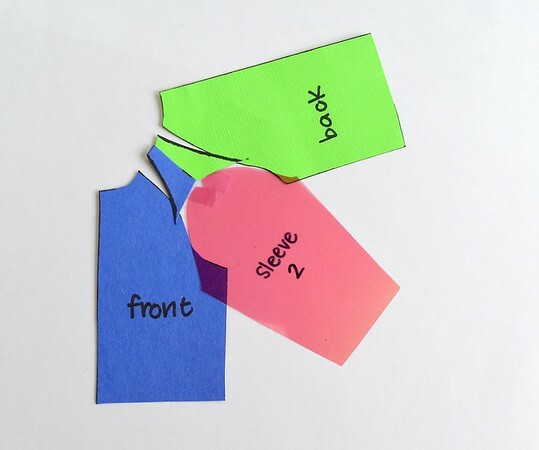 T-shirts, however, are usually made of knit fabric, which in itself is accommodating of all kinds of shapes and contours in the absence of other shaping devices (darts, seams, etc). Sometimes, we want a raglan cut in a more fitted garment that normally has darts. to achieve this fit. Or we want to transform our French dart sloper into a raglan one, darts and all, so that we get the custom fit we like. 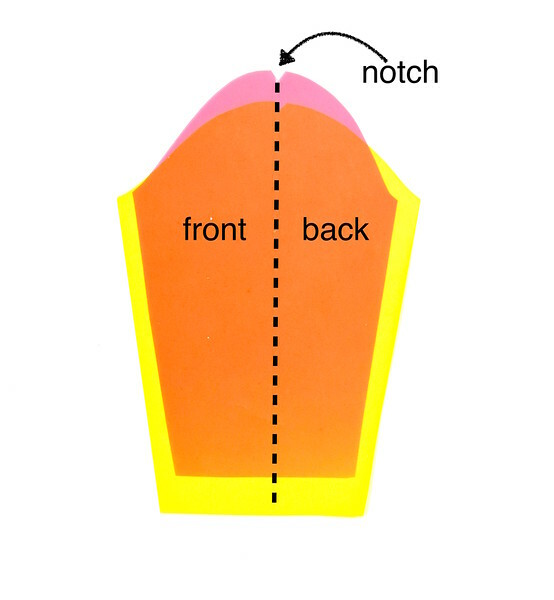 Let's say, for the purpose of illustration, that we have a bodice block with an armhole dart - very common for in drafts for the full-busted. We can also have a waist dart, but as that doesn't affect the sleeve or armhole directly, we'll ignore it in this exercise. 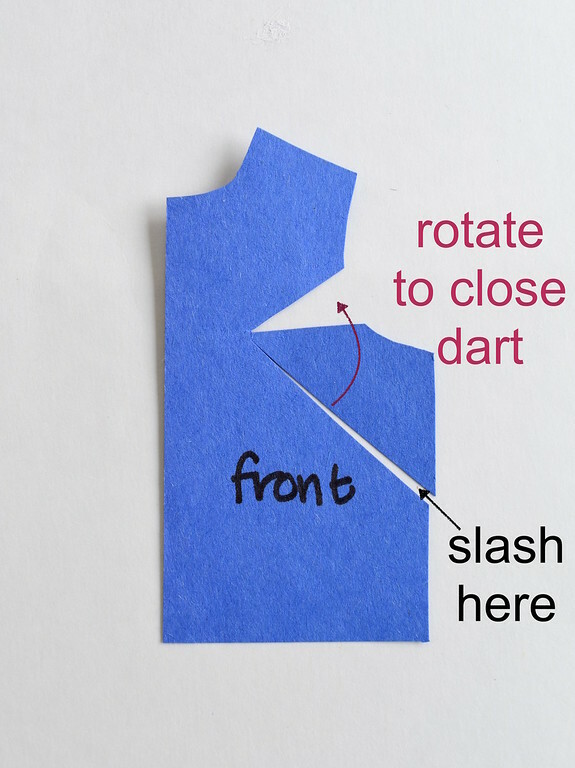 One of the simplest ways to deal with this troublesome armhole dart is to rotate it away from the armhole. 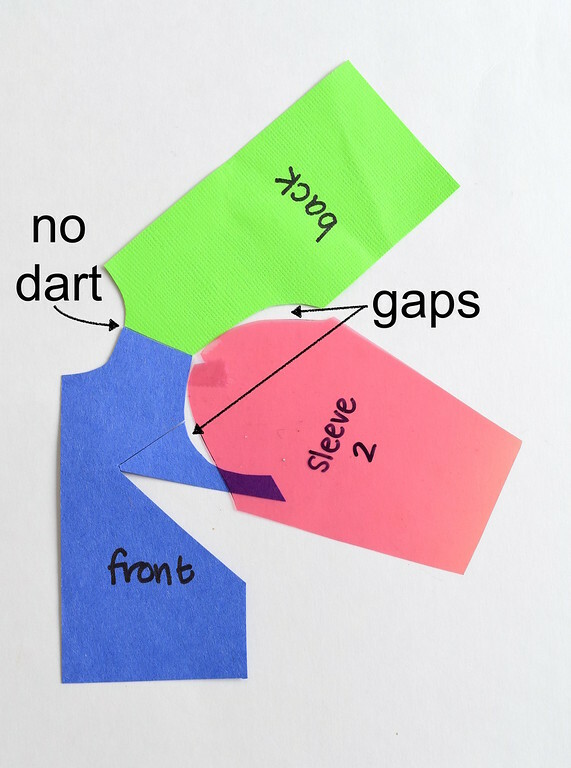 Now that dart has become an underbust dart, or side dart, which, if you like, you can combine with a pre-existing waist dart to turn into a ginormous true French dart. Go crazy - dart rotation and merging is fun. However, there is now a problem - the armhole has shrunk. So we need to reshape it to fit the sleeve cap. 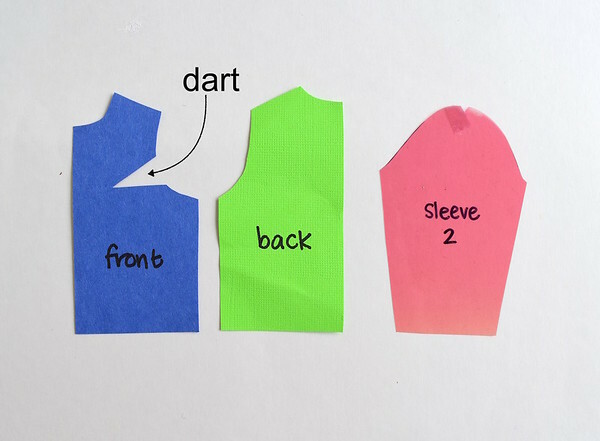 To visualize the big picture, see the photo below: when you've closed the new dart to get the finished, shapely front bodice, the sleeve should fit into that armhole. Let's open the dart again, so everything is flat once more. 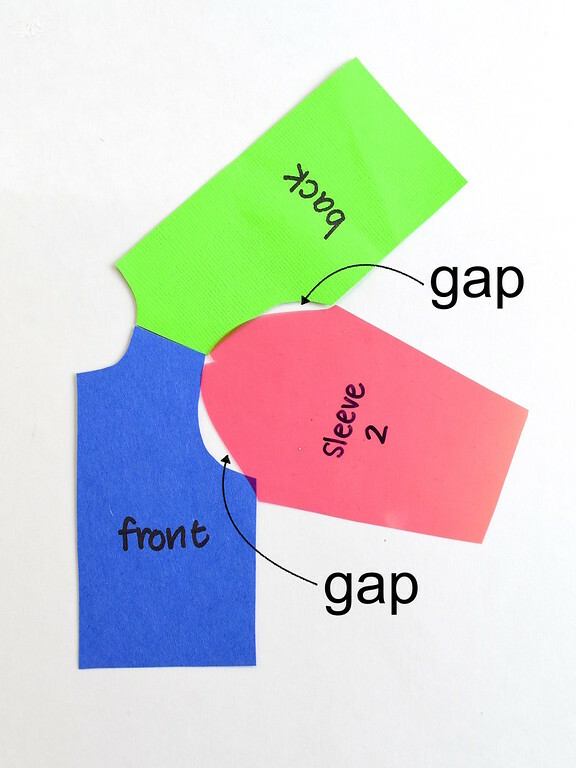 Again, when we fit the sleeve into the armhole, we don't really want those side gaps in the picture below. We'd rather have the shoulder dart to deal with, as before, because it's a quantifiable amount of ease that we can easily work with by darting, or shifting elsewhere. Here is one way to shift that ease, just as we'd done with Sleeve 2B. First, I draw a raglan line. I can free-hand it, or use some other reference block. Then I get it in position for the sleeve. with one in a different color. 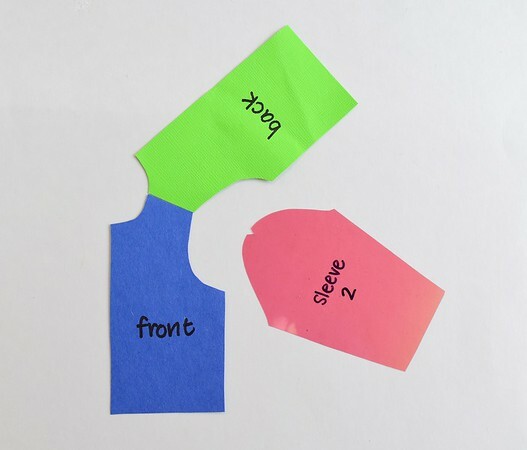 Now, draw the back raglan line as usual, in preparation for reshaping the old set-in-sleeve. and stuff it in the bust dart. Now the front of the bodice is flat and dartless, and a dart has appeared along the raglan line. What I've done is moved the excess ease from the bust dart to the raglan line. and smooth out the raglan lines along the sleeve (I also trimmed the sticky-out bit of the yellow wedge in the earlier photo). This is your new raglan sleeve block, that used to have an armhole dart, but now doesn't. 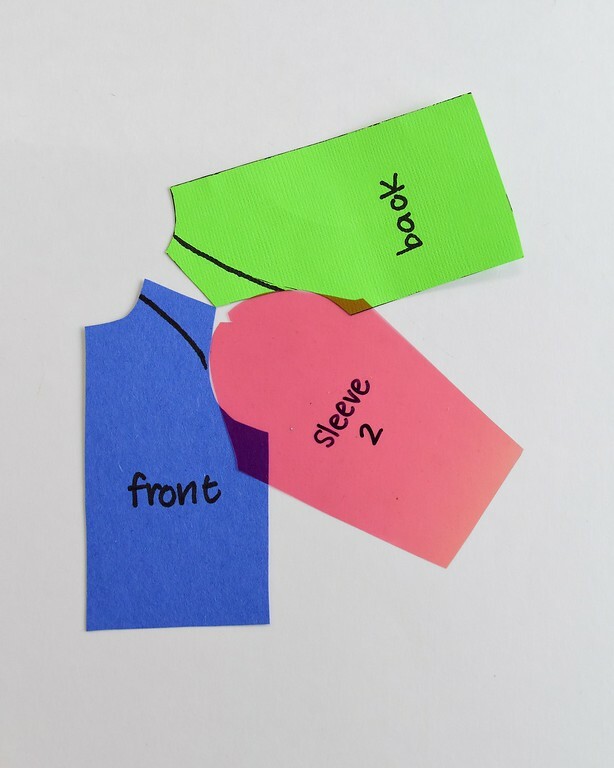 Let's compare the original purple block with this new green one, which has the bust dart's effect incorporated into the raglan line. 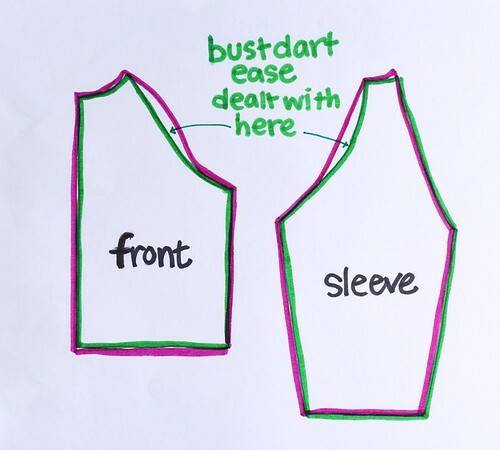 The final effect is bust contouring via the raglan line instead of with a bust dart. Here is an old muslin I made - the armpit was a bit of an ease-fest, and let's all laugh at the poor fit of the upper sleeve - but it was a muslin, and I was focusing on the contouring around the bust and shoulder in the absence of a dart. Here is a raglan garment on one of my kids - no need for a bust dart. As you might have surmised, converting blocks from one kind to another introduces a fair bit of imprecision, and the final fit will be still need to be refined by muslins. 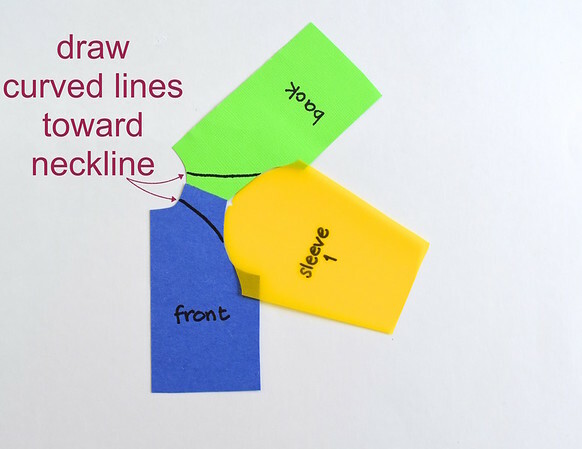 Even the illustrations in today's post are not methods, merely visual aids to demonstrate principles we employ to move ease, shape contours and transpose seams. Many people who begin to draft feel more secure with formulae and methods - being told to add a 1/2" darts in one place or subtract 2" from a seamline, for instance, is concrete and easily obeyed. However, they are only starting points at best, and arbitrary recipes at worst; at the end of the day, a good fit is achieved by drafting for contours, not measurements. And to that end, we should expect to make muslins to accommodate, among other things, the individual curves and hollows of real human bodies, the behavior of the intended fabric medium (woven, knit, drapey, heavy, floaty, stiff, etc. ), and the comfort level of the wearer (how tight should a sloper be for a 76-year-old vs. a 16-year-old?). I hope that understanding the underlying principles (rather than just knowing the recipes) for fit will help manage our expectations in the drafting process and, ultimately, result in success. This was great teaching. 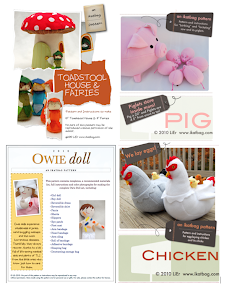 I love it when you make it visual, because it empowers me to go and make my own. Better than recipes : understanding the concepts in a new way... Thanks ! Fantastically interesting and very helpful. You are a terrific teacher. Thank you. Great tutorial!!! !, it seems so easy ;) Thank you for sharing!!!! Thank you, thank you, thank you. I've shied away from pattern altering (except for hems) and working with knits. As someone whose body is changing due to the effects of medication, sewing knit garments are looking more and more appealing. Holy cow! That's a heck of a post girl! Thank you! For someone who's dealing with hay fever, this is a very intense post. I love your brain, I love how this works, and I love your generosity. My obsession is at the armsceye. Where the sleeve and the front/back overlap, that's a gusset pattern. Thank you for this, LiEr! 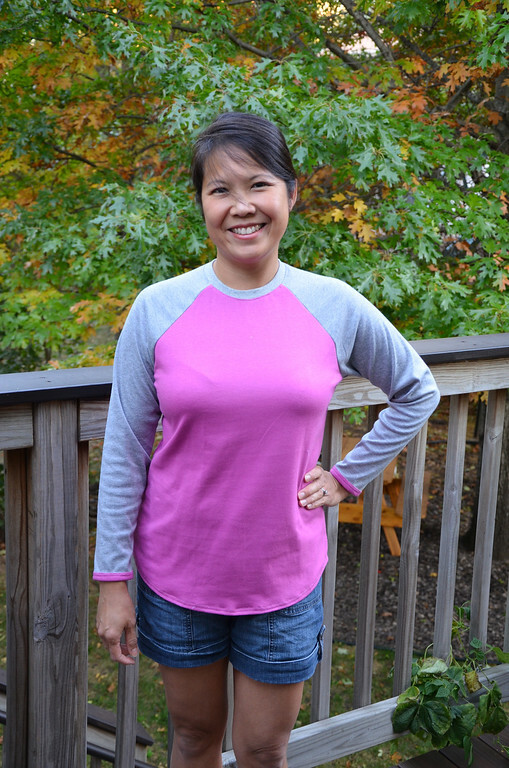 I love raglan sleeve tops! As I couldn't sleep I thought I'd find out about raglan slopers. 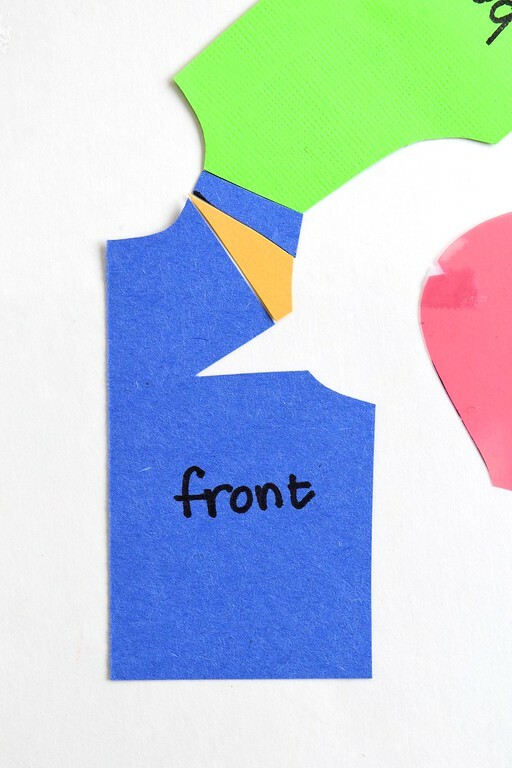 Came across your post, clear, concise and fantastic explanations. Thanks for taking the time to help others understand how things work. Now I definitely can't sleep, you've made me want to go and have a go. fantastic explanation of concepts. thank you so much! thank you for the easy answers! 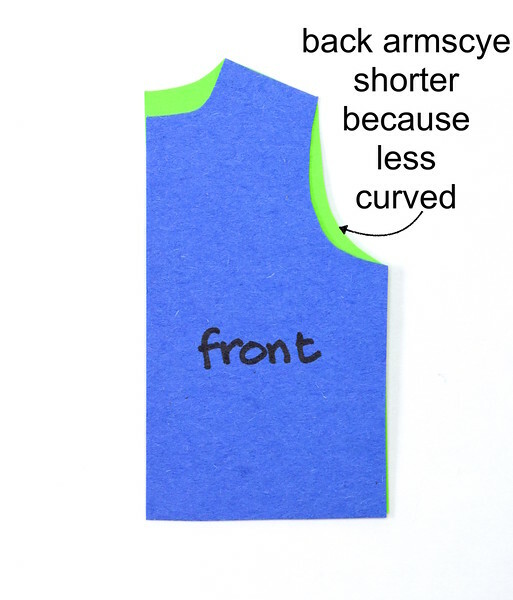 How does the armscye depth of a raglan sleeve compare to a set in sleeve, in a woven fabric garment? I read somewhere that raglan sleeve underarms are lower than a set in sleeve underarm for extra mobility. BUT... no other tutorial seems to make this allowance or even mention it at all. I'm still new to drafting my own patterns and sleeves are my nemesis. I'd be grateful for your input. There is surprisingly little advanced information about raglan sleeves available on the internet. 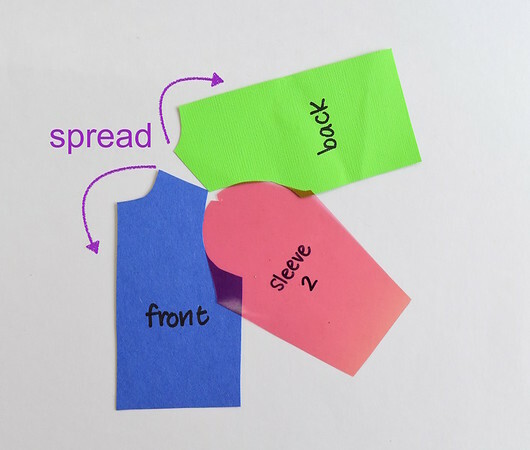 I am working on redrafting a "standard size" pattern for my plus size self. The original design is raglan sleeve that only goes about halfway to the neckline. I attempted to modify a bodice block for set in sleeves to a raglan bodice, because it was familiar, but I think I've just made it more difficult for myself, haha. Bonster: I hear you about there being precious little on the internet about constructing a raglan sleeve. Because I couldn't find any useful information myself, i asked my mother to teach me to draft one some years ago. Her method, as always, was based on some intuitive, secret concept that worked when her hand was drawing all the curves and lines but not when mine attempted to copy them. 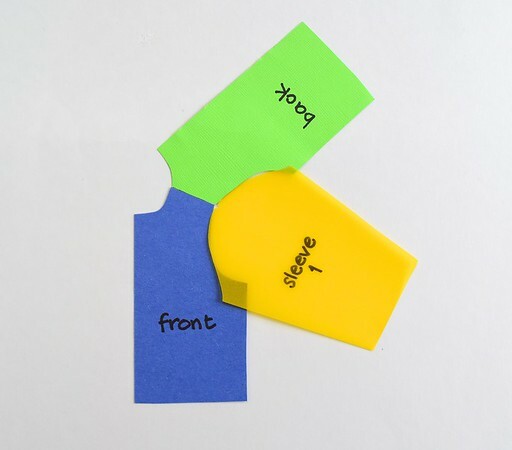 I understand (from ancient drafting books) that while raglan sleeves can be adapted from a basic set-in sleeve, the standard method of drafting them from foundational principles is by starting with a Magyar sleeve (you can google it) pattern. Neither of those sleeves has a set-in armhole, which indicates that it is difficult to compare sleeve depths between a raglan and a set-in. They are drafted from different foundations, which is a fancy way of saying the set-in sleeve is drafted from a fitted bicep and shoulder while the raglan/Magyar is not. I know this isn't immediately helpful :( Sorry. I wish you success in your drafting! Wonderful post! 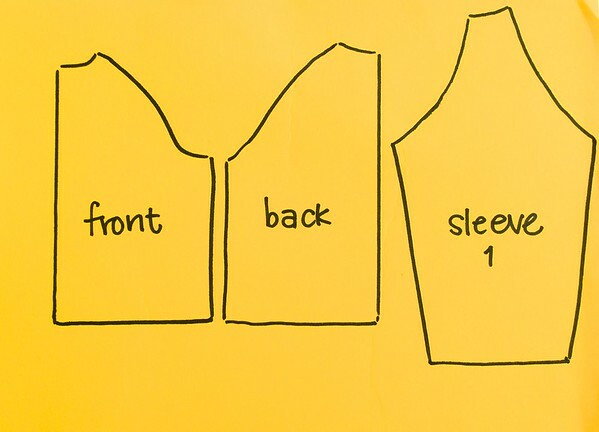 Thanks for breaking this down in a way that visually explains why the pattern takes the shape it does when you convert the sleeve. This is EXACTLY what I was searching for!